The Crankworx World Tour drops into the next dimension, where gravity knows no bounds. Four stops, one space for infinite creativity. Rotorua, New Zealand. Les Gets, France. Innsbruck, Austria – and home to its Canadian home base in Whistler, British Columbia. Push the perception of what’s possible and charge into the unimaginable. 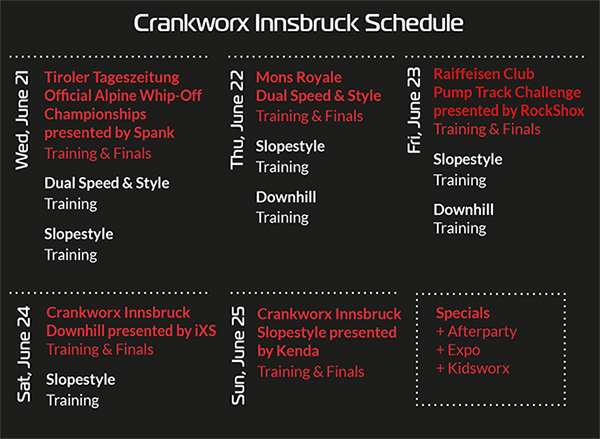 The third season of the Crankworx World Tour welcomes Innsbruck, Austria as stop number three of the four-stop Crankworx World Tour. Innsbruck is an epicenter for mountain sport competitions and freestyle sports, and one of the new gravity hot spots. It hosts Air+Style, ski jumping’s Four Hill tournament, the Climbing World Cup and so forth. The Bikepark Innsbruck (Muttereralmpark) will host the German-speaking wing of Crankworx and can be reached directly from the city centre in just a few minutes. Side events include after show parties, an expo and demo area presenting the newest gear and products as well as a special kids programme named Kidsworx.